If you are like me you have a tonne of these cute little Picture My Life™ cards or even some Project Life Cards, that you need to find other ways to use them before they take over your supplies entirely! So I am sharing with you some of the ways that you can use PML cards in your other papercrafting. Need a bunch of quick cards to keep on stash? Use the beautifully designed journal cards for the starring role of your card & accent with a range of fun embellishments. I mean why not some of these cards are just so pretty that they need to be used to decorate the home. You could create bunting, add a card to the Designed Décor Black Shadow Box that you want to frame – yes some of them are just pretty enough to frame! 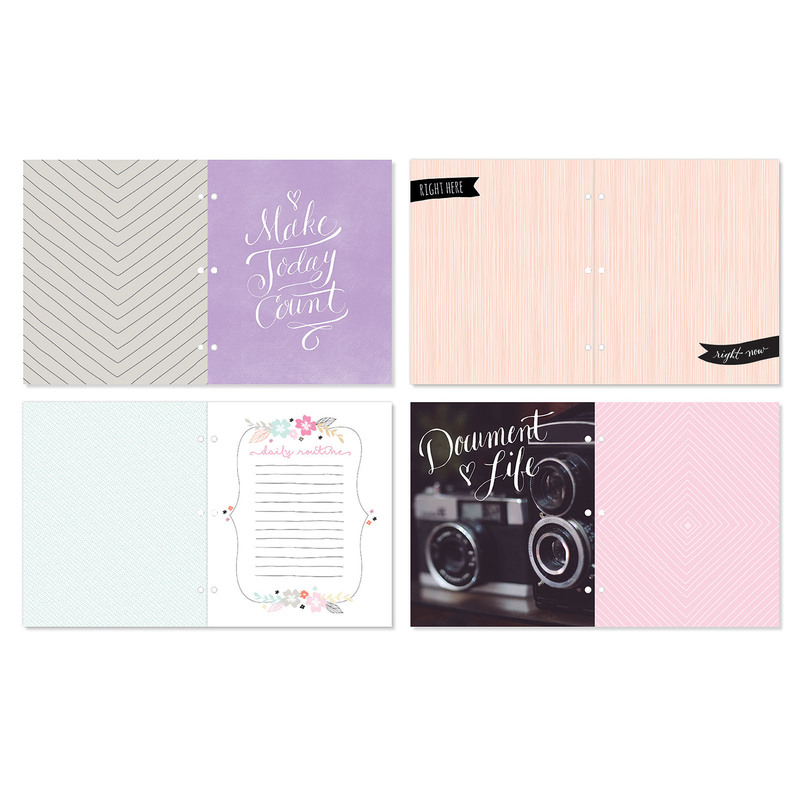 There are so many ways you can incorporate the PML journaling cards into your planner – as they do have journalling space they are great for writing good memories. The PML cards can make some sweet gift tags to jazz up your next gift be it for Birthday’s, Christmas or just because. Try creating this flipbook by hole punching the cards and sliding them onto a binder ring. In addition to using the cards for base pages, you can also use the 4″ x 3″ cards for matting photos, journaling, and creating tabs. I am forever writing to do lists – I started to write on the PML card & then tucked them away in a sleeve pocket in my planner so I can see what I need to do that week/day/hour! You could event make Dry-Erase To Do List Frame by framing it under some glass use a dry-erase marker to add love notes, reminders. One thing I love about this idea is that I keep the shopping list to add to a scrapbook layout/My Crush (smash) page for later as a great way to know my shopping habits & even look back years on the way prices of items have changed. If you are already doing Pocket style with your PML cards, why not mix it up & incorporate a traditional Scrapbook layout that features the PML cards – it will tie the two together & make the look cohesive in your album. Also ANY SIZE order using the Maz Gathering: Mystery Hostess Link will be entered to win the Hostess rewards for February. Make sure you take the time to round up your order & donate some money to Operation Smile™, an organization that provides free, life-changing surgery that repairs smiles and reshapes lives, one child at a time. Thanks so much for taking the time to read all the ideas I have how to use up all your PML cards. Do you have other ideas that you use Picture My Life™ cards for in your day to day papercrafting? Comment below & share them – love to know.…see you soon. We are celebrating National Papercrafting Month with the exclusive Picture My Life™ Live Your Day scrapbooking program on the Australasian Close to My Heart Blog Hop. If you have arrived here from the amazingly creative Vandra’s Virtual CTMH Craftroom then you are in the right place. I cut up some of the National Papercrafting Month Picture My Life™ Live Your Day pocket cards to use on this scrapbook layout & used one of the cards as a hidden journalling card. 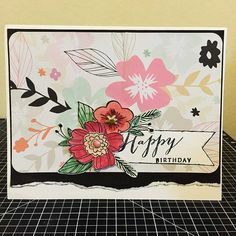 The layout also uses some Fundamental stickers, La Vie En Rose Paper & an image from the Botanical Backgrounds (D1645) stamp set coloured in with the ShinHan™ Touch Twin™ Markers. For this card I used one of theNational Papercrafting Month Picture My Life™ Live Your Day whole as the background to showcase the Cute Critters Fox. Some water colour was added to the card for some extra pop of colour & used to colour in the cute fox. I kept the embellishments simple which made this a very quick & easy card. I’d love for you to leave a comment before heading off to the next stop, the very talented: Jenny Gilbert: The Creative Heart, who I am sure will showcase something amazing with National Papercrafting Month Picture My Life™ Live Your Day set! Enjoy the hop and thanks so much for taking the time to check out these ideas with the National Papercrafting Month Picture My Life™ Live Your Day…see you soon. There are plenty of types of people out there that make up the scrapbooking community & everyone has their own way of scrapbooking that works for them. It’s your scrapbook, you can make it look however you want! Here are a bunch of different ways you can scrapbook your memories. Also known as digi scrapbooking, starts on the computer. The digital scrapbooker uses photo editing software to add clipart and templates to their digital photos, to preserve the memories. Designing a digital scrapbook is comparable to traditional scrapbooking, except your pages are created with your computer using a scrapbook software program. Close to My Heart’s Studio J is a FREE online digital scrapbooking design software that helps you easily create custom-printed two-page layouts using our foundational scrapbook patterns, exclusive colour palette, and themed designs all delivered in 12″ × 12″ custom prints ready for your albums. It’s a snap! If you prefer the hands on approach, like cutting papers and gluing embellishments to their page. Then you are into Traditional Scrapbooking. Traditional scrapbooking allows you to reach out and touch your embellishments. You can run your fingers across a ribbon and feel the embossing on letters. It is a system designed around 3 x 4 and 6 x 4 pre cut cards which you insert into pockets in a page protector, along with photos. It is ideal for getting your memories into albums in a quick, no fuss way. Close To My Heart’s Picture My Life™ Scrapbooking Program have cards that have the same design on both sides. One side features the design vertically and the other side features it horizontally. This allows for flexibility in designing your overall pocket scrapbook page. If you are looking for a fun way to journal ideas or keep lists, it’s time to Crush it with My Crush® Everyday Life Pages from Close to My Heart! This method requires no cutting and is so perfect for people on the go who want to keep track of their lives, trips and adventures! With no rules or requirements, they’re an “anything goes” type of scrapbook. Just attach your photos, ticket stubs, lists and any other ephemera you collect, add your journaling and you’re done! Hybrid scrapbooking is the combination of styles. It’s the best of both worlds. It can bridge the gap between traditional and digital scrapbooking by combining elements of both. For instance, print your pages & then add embellishments. 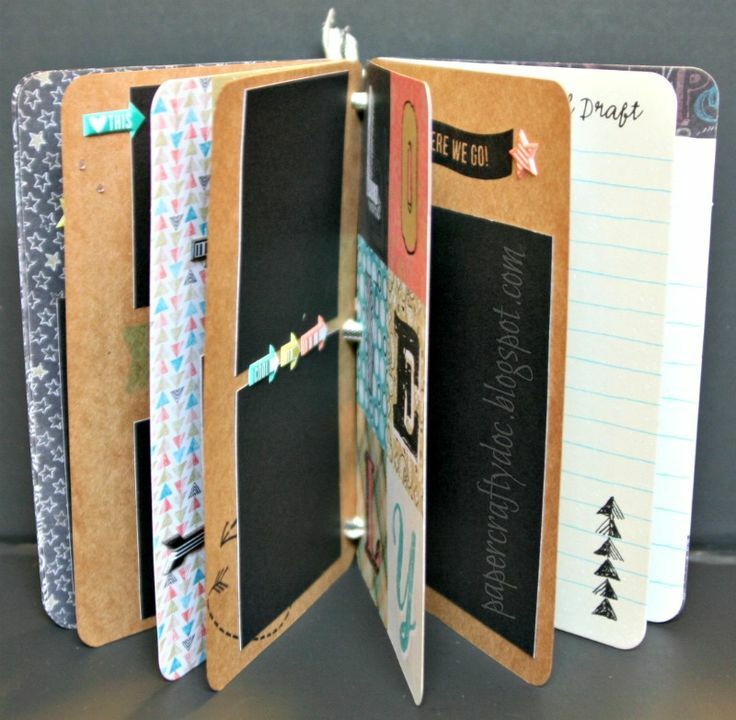 Or create a hybrid of Pocket Scrapbooking with Traditional Scrapbooking to allow you to add extra journalling or photos to your traditional layout. Create digital journalling pocket cards & add to your pocket or traditional scrapbook. Smash in your life onto a traditional scrapbook page – Hybrid is a mix & match of different ways of scrapbooking all into one. Whatever way you scrapbook, the end result is the same – you create beautiful works of art which are unique and sentimental to you or the person you make something for. Remember what I wrote at the beginning? The important thing is to preserve your memories & in the process exercise your creativity. The method that is right for you is the one that makes your heart sing. Have a go of them all to see what works for you. Thanks so much for taking the time to check out this article…see you soon. So just in case you missed the news – the CTMH Planners are here! But maybe you hadn’t realised that it is more than just a Planner. It is a way to showcase your Everyday Life & the way you use it – well the possibilities are endless. Or Mix it up to create a unique album! You can find out more from CTMH blog. Source: The Everyday Life™ Line Has Arrived! Check out this great idea to create your own pocket scrapbooking cards with the Hello, Life!—Pocket Scrapbooking stamp set. Your picture-perfect pocket scrapbooking adventure awaits! Each Picture My Life scrapbooking program already includes a coordinating 10-pack of Memory Protectors, so when you add your additional 10-pack for only $4 AUD / $4.50 NZD you will be well on your way to your own picture-perfect pocket scrapbooking adventure!